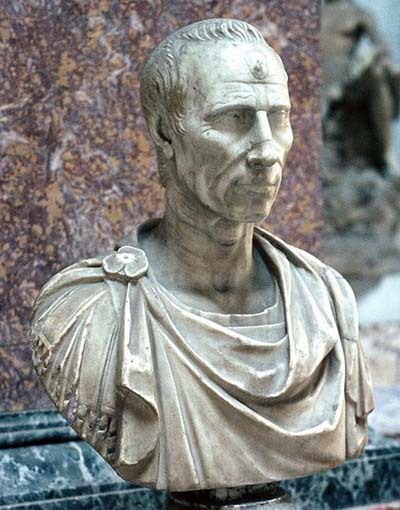 Julius Caesar (July 100 BC - March 15, 44 BC) was a Roman general and statesman and a distinguished writer of Latin prose. He played a critical role in the gradual transformation of the Roman Republic into the Roman Empire. In 60 BC, Caesar, Crassus and Pompey formed a political alliance that was to dominate Roman politics for several years. 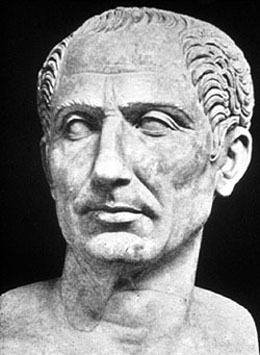 Their attempts to amass power through populist tactics were opposed by the conservative elite within the Roman Senate, among them Cato the Younger with the frequent support of Cicero. Caesar's conquest of Gaul, completed by 51 BC, extended Rome's territory to the English Channel and the Rhine. Caesar became the first Roman general to cross both when he built a bridge across the Rhine and conducted the first invasion of Britain. These achievements granted him unmatched military power and threatened to eclipse Pompey's standing. The balance of power was further upset by the death of Crassus in 53 BC. Political realignments in Rome finally led to a standoff between Caesar and Pompey, the latter having taken up the cause of the Senate. Ordered by the Senate to stand trial in Rome for various charges, Caesar marched from Gaul to Italy with his legions, crossing the Rubicon in 49 BC. This sparked a civil war from which he emerged as the unrivaled leader of the Roman world. After assuming control of government, he began extensive reforms of Roman society and government. He centralized the bureaucracy of the Republic and was eventually proclaimed "dictator in perpetuity". 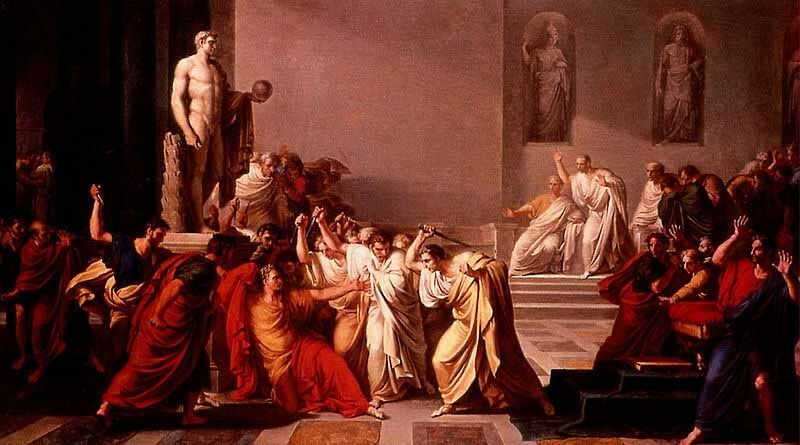 A group of senators, led by Marcus Junius Brutus, assassinated the dictator on the Ides of March 15, 44 BC, hoping to restore the constitutional government of the Republic. However, the result was a series of civil wars, which ultimately led to the establishment of the permanent Roman Empire by Caesar's adopted heir Octavius (later known as Augustus). Much of Caesar's life is known from his own accounts of his military campaigns, and other contemporary sources, mainly the letters and speeches of Cicero and the historical writings of Sallust. The later biographies of Caesar by Suetonius and Plutarch are also major sources. Caesar was born into a patrician family, the gens Julia, which claimed descent from Iulus, son of the legendary Trojan prince Aeneas, supposedly the son of the goddess Venus. 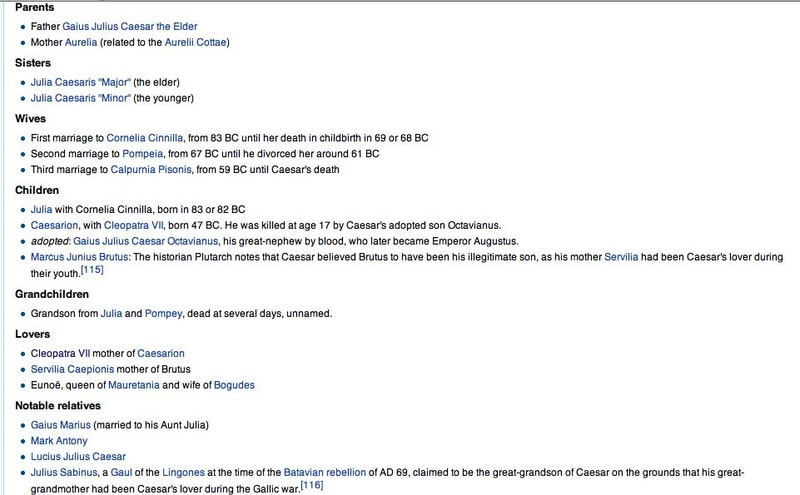 The cognomen "Caesar" originated, according to Pliny the Elder, with an ancestor who was born by caesarean section (from the Latin verb to cut, caedere, caes-). The Historia Augusta suggests three alternative explanations: that the first Caesar had a thick head of hair (Latin caesaries); that he had bright grey eyes (Latin oculis caesiis); or that he killed an elephant (caesai in Moorish) in battle. 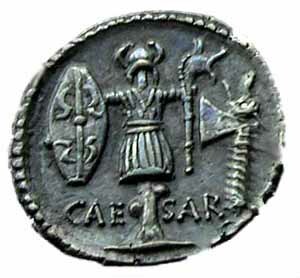 Caesar issued coins featuring images of elephants, suggesting that he favored this interpretation of his name. Despite their ancient pedigree, the Julii Caesares were not especially politically influential. Caesar's father, also called Gaius Julius Caesar, governed the province of Asia, while his mother, Aurelia Cotta, came from an influential family. Little is recorded of Caesar's childhood. Caesar's formative years were a time of turmoil. There were several wars from 91 BC to 82 BC, although from 82 BC to 80 BC, the dictator Lucius Cornelius Sulla was purging Rome of his political enemies. Domestically, Roman politics was bitterly divided. In 85 BC, Caesar's father died suddenly so at sixteen Caesar was the head of the family. The following year he was nominated to be the new high priest of Jupiter. Since the holder of that position not only had to be a patrician but also be married to a patrician, he broke off his engagement to a plebeian girl he had been betrothed to since boyhood, and married Lucius Cinna's daughter Cornelia. Then, having brought Mithridates to terms, Sulla returned to Rome and had himself appointed to the revived office of dictator. Sulla's proscriptions saw hundreds of his political enemies killed or exiled. Caesar, as the nephew of Marius and son-in-law of Cinna, was targeted. He was stripped of his inheritance, his wife's dowry and his priesthood, but he refused to divorce Cornelia and was forced to go into hiding. 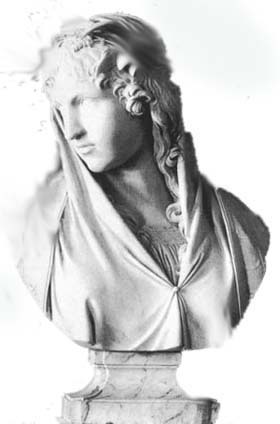 The threat against him was lifted by the intervention of his mother's family, which included supporters of Sulla, and the Vestal Virgins. Sulla gave in reluctantly, and is said to have declared that he saw many a Marius in Caesar. Caesar left Rome and joined the army, where he won the Civic Crown for his part in an important siege. On a mission to Bithynia to secure the assistance of King Nicomedes's fleet, he spent so long at his court that rumors of an affair with the king arose, which Caesar would vehemently deny for the rest of his life. Ironically, the loss of his priesthood had allowed him to pursue a military career, as the high priest of Jupiter was not permitted to touch a horse, sleep three nights outside his own bed or one night outside Rome, or look upon an army. Hearing of Sulla's death in 78 BC, Caesar felt safe enough to return to Rome. Lacking means since his inheritance was confiscated, he acquired a modest house in a lower-class neighborhood of Rome. Instead, he turned to legal advocacy. He became known for his exceptional oratory, accompanied by impassioned gestures and a high-pitched voice, and ruthless prosecution of former governors notorious for extortion and corruption. On the way across the Aegean Sea, Caesar was kidnapped by pirates and held prisoner. He maintained an attitude of superiority throughout his captivity. When the pirates thought to demand a ransom of twenty talents of silver, he insisted they ask for fifty. After the ransom was paid, Caesar raised a fleet, pursued and captured the pirates, and imprisoned them. He had them crucified on his own authority, as he had promised while in captivity - a promise the pirates had taken as a joke. As a sign of leniency, he first had their throats cut. He was soon called back into military action in Asia, raising a band of auxiliaries to repel an incursion from the east. On his return to Rome, he was elected military tribune, a first step in a political career. He was elected quaestor for 69 BC, and during that year he delivered the funeral oration for his aunt Julia. His wife, Cornelia, also died that year. After her funeral, in the spring or early summer of 69 BC, Caesar went to serve his quaestorship in Spain. While there he is said to have encountered a statue of Alexander the Great, and realized with dissatisfaction he was now at an age when Alexander had the world at his feet, while he had achieved comparatively little. On his return in 67 BC he married Pompeia, a granddaughter of Sulla, whom he later divorced. In 63 BC, he ran for election to the post of Pontifex Maximus, chief priest of the Roman state religion. He ran against two powerful senators. There were accusations of bribery by all sides. Caesar won comfortably, despite his opponents' greater experience and standing. When Cicero, who was consul that year, exposed Catiline's conspiracy to seize control of the republic, several senators accused Caesar of involvement in the plot. After his praetorship, Caesar was appointed to govern Spain, but he was still in considerable debt and needed to satisfy his creditors before he could leave. He turned to Marcus Licinius Crassus, one of Rome's richest men. In return for political support in his opposition to the interests of Pompey, Crassus paid some of Caesar's debts and acted as guarantor for others. Even so, to avoid becoming a private citizen and thus be open to prosecution for his debts, Caesar left for his province before his praetorship had ended. In Spain, he conquered two local tribes and was hailed as imperator by his troops, reformed the law regarding debts, and completed his governorship in high esteem. As imperator, Caesar was entitled to a triumph. However, he also wanted to stand for consul, the most senior magistracy in the republic. If he were to celebrate a triumph, he would have to remain a soldier and stay outside the city until the ceremony, but to stand for election he would need to lay down his command and enter Rome as a private citizen. He could not do both in the time available. He asked the senate for permission to stand in absentia, but Cato blocked the proposal. Faced with the choice between a triumph and the consulship, Caesar chose the consulship. In 60 BC, Caesar sought election as consul for 59 BC, along with two other candidates. The election was sordid � even Cato, with his reputation for incorruptibility, is said to have resorted to bribery in favor of one of Caesar's opponents. Caesar won, along with conservative Marcus Bibulus. Caesar was still deeply in debt, and there was money to be made as a governor, whether by extortion or by military adventurism. Caesar had four legions under his command, two of his provinces bordered on unconquered territory, and parts of Gaul were known to be unstable. Some of Rome's Gallic allies had been defeated by their rivals, with the help of a contingent of Germanic tribes. The Romans feared these tribes were preparing to migrate south, closer to Italy, and that they had warlike intent. Caesar raised two new legions and defeated these tribes. In response to Caesar's earlier activities, the tribes in the north-east began to arm themselves. Caesar treated this as an aggressive move and, after an inconclusive engagement against the united tribes, he conquered the tribes piecemeal. Meanwhile, one of his legions began the conquest of the tribes in the far north (directly opposite Britain). During the spring of 56 BC, the Triumvirate held a conference, as Rome was in turmoil and Caesar's political alliance was coming undone. The meeting renewed the Triumvirate and extended Caesar's governorship for another five years. The conquest of the north was soon completed, while a few pockets of resistance remained. Caesar now had a secure base from which to launch an invasion of Britain. In 55 BC, Caesar repelled an incursion into Gaul by two Germanic tribes, and followed it up by building a bridge across the Rhine and making a show of force in Germanic territory, before returning and dismantling the bridge. Late that summer, having subdued two other tribes, he crossed into Britain, claiming that the Britons had aided one of his enemies the previous year possibly the Veneti of Brittany. His intelligence information was poor, and although he gained a beachhead on the coast, he could not advance further, and returned to Gaul for the winter. He returned the following year, better prepared and with a larger force, and achieved more. He advanced inland, and established a few alliances. However, poor harvests led to widespread revolt in Gaul, which forced Caesar to leave Britain for the last time. In 52 BC another, larger revolt erupted in Gaul, led by Vercingetorix. Vercingetorix managed to unite the Gallic tribes and proved an astute commander, defeating Caesar in several engagements, but Caesar's elaborate siege-works at the Battle of Alesia finally forced his surrender. Despite scattered outbreaks of warfare the following year, Gaul was effectively conquered. 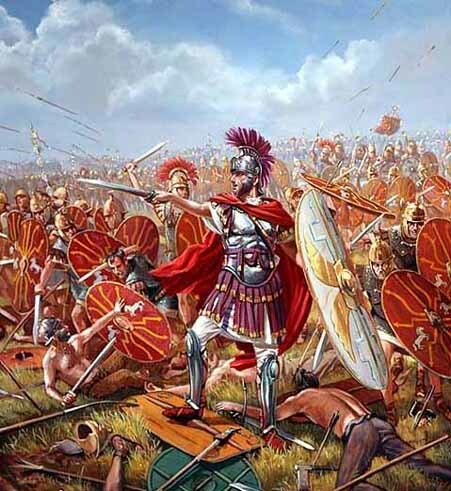 Plutarch claimed that the army had fought against three million men during the Gallic Wars, of whom one million died, and another million were enslaved. The Romans subjugated 300 tribes and destroyed 800 cities. However, in view of the difficulty in finding accurate counts in the first place, Caesar's propagandistic purposes, and the common exaggeration of numbers in ancient texts, the stated totals of enemy combatants are likely to be too high. In January 49 BC, Caesar crossed the Rubicon river (the frontier boundary of Italy) with only one legion and ignited civil war. Upon crossing the Rubicon, Caesar, according to Plutarch and Suetonius, is supposed to have quoted the Athenian playwright Menander, in Greek, "the die is cast". Erasmus, however, notes that the more accurate translation of the Greek imperative mood would be "alea icta esto" let the die be cast. Pompey and much of the Senate fled to the south, having little confidence in his newly raised troops. 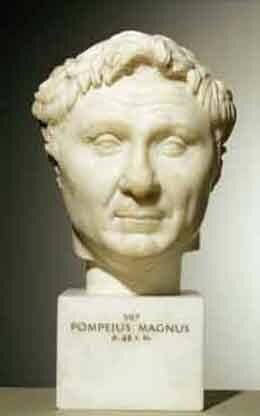 Despite greatly outnumbering Caesar, who only had his Thirteenth Legion with him, Pompey did not intend to fight. Caesar pursued Pompey, hoping to capture him before his legions could escape. Pompey managed to escape before Caesar could capture him. Caesar decided to head for Spain, while leaving Italy under the control of Mark Antony. Caesar made an astonishing 27-day route-march to Spain, where he defeated Pompey's lieutenants. He then returned east, to challenge Pompey in Greece where in July 48 BC at Dyrrhachium Caesar barely avoided a catastrophic defeat. He decisively defeated Pompey at Pharsalus in an exceedingly short engagement later that year. In Rome, Caesar was appointed dictator, with Mark Antony as his Master of the Horse (second in command); Caesar presided over his own election to a second consulship and then, after eleven days, resigned this dictatorship. Caesar then pursued Pompey to Egypt, where Pompey was soon murdered. Caesar then became involved with an Egyptian civil war between the child pharaoh and his sister, wife, and co-regent queen, Cleopatra VII. 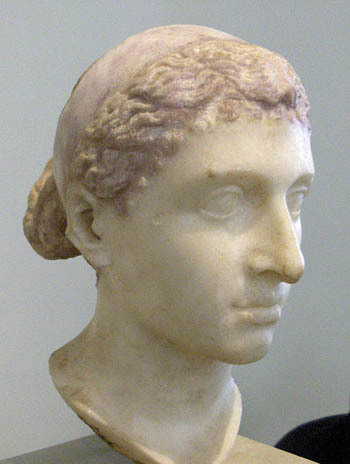 Perhaps as a result of the pharaoh's role in Pompey's murder, Caesar sided with Cleopatra; he is reported to have wept at the sight of Pompey's head, which was offered to him by the pharaoh as a gift. In any event, Caesar withstood the Siege of Alexandria and later he defeated the pharaoh's forces Battle of the Nile in 47 BC and installed Cleopatra as ruler. 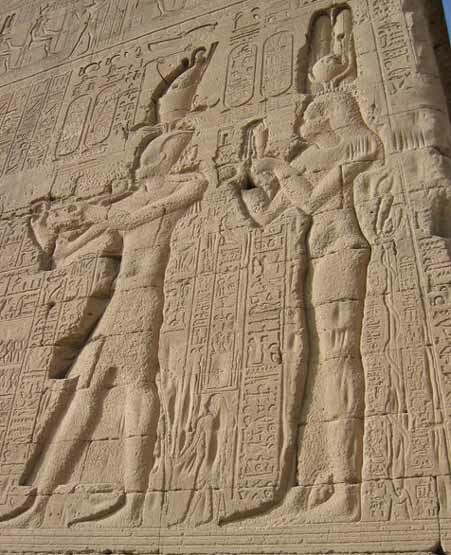 Caesar and Cleopatra celebrated their victory with a triumphant procession on the Nile in the spring of 47 BC. The royal barge was accompanied by 400 additional ships, and Caesar was introduced to the luxurious lifestyle of the Egyptian pharaohs. Caesar and Cleopatra never married, as Roman law recognized marriages only between two Roman citizens. Caesar continued his relationship with Cleopatra throughout his last marriage, which lasted fourteen years - in Roman eyes, this did not constitute adultery - and may have fathered a son called Caesarion. 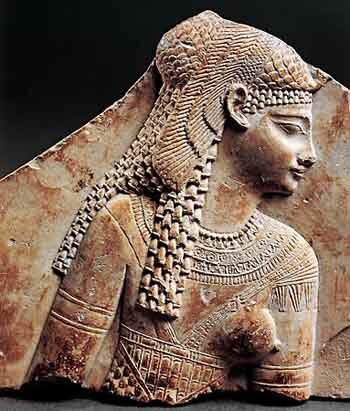 Cleopatra visited Rome on more than one occasion, residing in Caesar's villa just outside Rome across the Tiber. Late in 48 BC, Caesar was again appointed Dictator, with a term of one year. After spending the first months of 47 BC in Egypt, Caesar went to the Middle East, where he annihilated the king of Pontus; his victory was so swift and complete that he mocked Pompey's previous victories over such poor enemies. Thence, he proceeded to Africa to deal with the remnants of Pompey's senatorial supporters. He quickly gained a significant victory in 46 BC over Cato, who then committed suicide. After this victory, he was appointed Dictator for ten years. Nevertheless, Pompey's sons escaped to Spain; Caesar gave chase and defeated the last remnants of opposition in the Battle of Munda in March 45 BC. During this time, Caesar was elected to his third and fourth terms as consul in 46 BC and 45 BC (this last time without a colleague). Caesar's Civil War was one of the last politico-military conflicts in the Roman Republic before the establishment of the Roman Empire. It began as a series of political and military confrontations, between Julius Caesar (100-44 BC), his political supporters (broadly known as Populares), and his legions, against the Optimates (or Boni), the politically conservative, socially traditionalist faction of the Roman Senate, who were supported by Pompey (106-48 BC) and his legions. After a four-year-long (49-45 BC) politico-military struggle, fought in Italy, Greece, Egypt, Africa, and Hispania, Caesar defeated the last of the Optimates in the Battle of Munda and became Dictator perpetuus (Perpetual Dictator) of Rome. The changes to Roman government concomitant to the war mostly eliminated the political traditions of the Roman Republic (509-27 BC) and led to the Roman Empire (27 BC-AD 476). While he was still campaigning in Spain, the Senate began bestowing honors on Caesar. Caesar had not proscribed his enemies, instead pardoning almost all, and there was no serious public opposition to him. Great games and celebrations were held in April to honor Caesar�s victory at Munda. Plutarch writes that many Romans found the triumph held following Caesar's victory to be in poor taste, as those defeated in the civil war had not been foreigners, but instead fellow Romans. On Caesar's return to Italy in September 45 BC, he filed his will, naming his grandnephew Gaius Octavius (Octavian) as the heir to everything, including his name. Caesar also wrote that if Octavian died before Caesar did, Marcus Junius Brutus would be the next heir in succession. Between his crossing of the Rubicon River in 49 BC, and his assassination in 44 BC, Caesar established a new constitution, which was intended to accomplish three separate goals. When Caesar returned to Rome, the Senate granted him triumphs for his victories, ostensibly over Gaul, Egypt, Pharnaces and Juba, rather than over his Roman opponents. Not everything went Caesar's way. 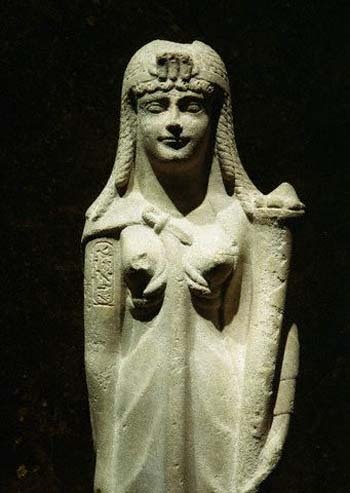 When Arsinoe IV, Egypt's former queen, was paraded in chains, the spectators admired her dignified bearing and were moved to pity. Triumphal games were held, with beast-hunts involving 400 lions, and gladiator contests. A naval battle was held on a flooded basin at the Field of Mars. At the Circus Maximus, two armies of war captives, each of 2,000 people, 200 horse and 20 elephants, fought to the death. Again, some bystanders complained, this time at Caesar's wasteful extravagance. A riot broke out, and only stopped when Caesar had two rioters sacrificed by the priests on the Field of Mars. After the triumph, Caesar set forth to passing an unprecedented legislative agenda. He ordered a census be taken, which forced a reduction in the grain dole, and that jurors could only come from the Senate or the equestrian ranks. He passed a sumptuary law that restricted the purchase of certain luxuries. Afterwards, he passed a law that rewarded families for having many children, to speed up the repopulation of Italy. Then he outlawed professional guilds, except those of ancient foundation, since many of these were subversive political clubs. He then passed a term limit law applicable to governors. He passed a debt restructuring law, which ultimately eliminated about a fourth of all debts owed. The most important change, however, was his reform of the calendar. The calendar at the time was regulated by the movement of the moon, and this had resulted in a great deal of disorder. Caesar replaced this calendar with the Egyptian calendar, which was regulated by the sun. He set the length of the year to 365.25 days by adding an intercalary/leap day at the end of February every fourth year. To bring the calendar into alignment with the seasons, he decreed that three extra months be inserted into 46 BC (the ordinary intercalary month at the end of February, and two extra months after November). Thus, the Julian calendar opened on 1 January 45 BC. This calendar is almost identical to the current Western calendar. Shortly before his assassination, he passed a few more reforms. He established a police force, appointed officials to carry out his land reforms, and ordered the rebuilding of Carthage and Corinth. He also extended Latin rights throughout the Roman world, and then abolished the tax system and reverted to the earlier version that allowed cities to collect tribute however they wanted, rather than needing Roman intermediaries. His assassination prevented further and larger schemes, which included the construction of an unprecedented temple to Mars, a huge theater, and a library on the scale of the Library of Alexandria. He also wanted to convert Ostia to a major port, and cut a canal through the Isthmus of Corinth. Militarily, he wanted to conquer the Dacians, Parthians, and avenge the loss at Carrhae. Thus, he instituted a massive mobilization. Shortly before his assassination, the Senate named him censor for life and Father of the Fatherland, and the month of Quintilis was renamed July in his honor. He was granted further honors, which were later used to justify his assassination as a would-be divine monarch; coins were issued bearing his image and his statue was placed next to those of the kings. He was granted a golden chair in the Senate, was allowed to wear triumphal dress whenever he chose, and was offered a form of semi-official or popular cult, with Mark Antony as his high priest. The history of Caesar's political appointments is complex and uncertain. Caesar held both the dictatorship and the tribunate, but alternated between the consulship and the Proconsulship. His powers within the state seem to have rested upon these magistracies. He was first appointed dictator in 49 BC possibly to preside over elections, but resigned his dictatorship within eleven days. In 48 BC, he was re-appointed dictator, only this time for an indefinite period, and in 46 BC, he was appointed dictator for ten years. In February 44 BC, one month before his assassination, he was appointed dictator for life. Under Caesar, a significant amount of authority was vested in his lieutenants, mostly because Caesar was frequently out of Italy. In October 45 BC, Caesar resigned his position as sole consul, and facilitated the election of two successors for the remainder of the year which theoretically restored the ordinary consulship, since the constitution did not recognize a single consul without a colleague. In 48 BC, Caesar was given permanent tribunician powers, which made his person sacrosanct and allowed him to veto the Senate, although on at least one occasion, tribunes did attempt to obstruct him. The offending tribunes in this case were brought before the Senate and divested of their office. This was not the first time that Caesar had violated a tribune's sacrosanctity. After he had first marched on Rome in 49 BC, he forcibly opened the treasury although a tribune had the seal placed on it. After the impeachment of the two obstructive tribunes, Caesar, perhaps unsurprisingly, faced no further opposition from other members of the Tribunician College. In 46 BC, Caesar gave himself the title of "Prefect of the Morals", which was an office that was new only in name, as its powers were identical to those of the censors. Thus, he could hold censorial powers, while technically not subjecting himself to the same checks that the ordinary censors were subject to, and he used these powers to fill the Senate with his own partisans. He also set the precedent, which his imperial successors followed, of requiring the Senate to bestow various titles and honors upon him. He was, for example, given the title of "Father of the Fatherland" and "imperator". When Caesar returned to Rome in 47 BC, the ranks of the Senate had been severely depleted, and so he used his censorial powers to appoint many new senators, which eventually raised the Senate's membership to 900. All the appointments were of his own partisans, which robbed the senatorial aristocracy of its prestige, and made the Senate increasingly subservient to him. 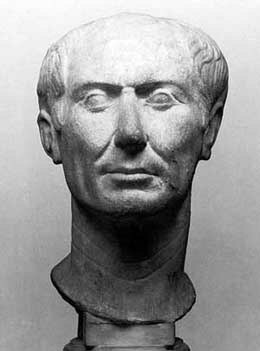 To minimize the risk that another general might attempt to challenge him, Caesar passed a law that subjected governors to term limits. Near the end of his life, Caesar began to prepare for a war against the Parthian Empire. Since his absence from Rome might limit his ability to install his own consuls, he passed a law which allowed him to appoint all magistrates in 43 BC, and all consuls and tribunes in 42 BC. This, in effect, transformed the magistrates from being representatives of the people to being representatives of the dictator. The Constitutional Reforms of Julius Caesar were a series of laws that were enacted by the Roman Dictator Julius Caesar between 49 and 44 BC, which reformed the Constitution of the Roman Republic. The era that began when Caesar crossed the Rubicon River in 49 BC, and ended when Octavian returned to Rome after the Battle of Actium in 29 BC, can be divided into two distinct units. Caesar later died in 44 BC and never got to liveout his great reforms. 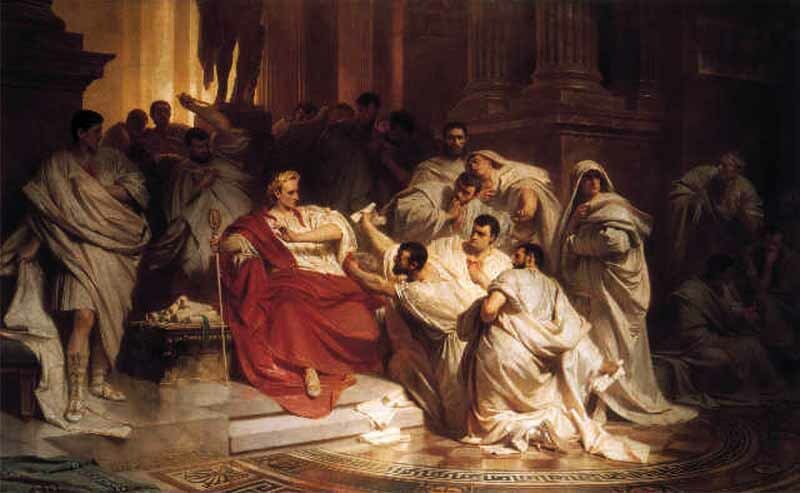 On the Ides of March of 44 BC, Caesar was due to appear at a session of the Senate. Mark Antony, having vaguely learned of the plot the night before from a terrified Liberator named Servilius Casca, and fearing the worst, went to head Caesar off. The plotters, however, had anticipated this and, fearing that Antony would come to Caesar's aid, had arranged for Trebonius to intercept him just as he approached the portico of Theatre of Pompey, where the session was to be held, and detain him outside. (Plutarch, however, assigns this action to delay Antony to Brutus Albinus). When he heard the commotion from the senate chamber, Antony fled. 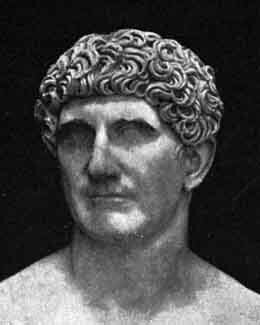 According to Plutarch, as Caesar arrived at the Senate, Tillius Cimber presented him with a petition to recall his exiled brother. The other conspirators crowded round to offer support. Both Plutarch and Suetonius say that Caesar waved him away, but Cimber grabbed his shoulders and pulled down Caesar's tunic. Caesar then cried to Cimber, "Why, this is violence!" ("Ista quidem vis est!"). At the same time, Casca produced his dagger and made a glancing thrust at the dictator's neck. Caesar turned around quickly and caught Casca by the arm. According to Plutarch, he said in Latin, "Casca, you villain, what are you doing?" Casca, frightened, shouted, "Help, brother!" in Greek ("adelphe, boethei!"). Within moments, the entire group, including Brutus, was striking out at the dictator. Caesar attempted to get away, but, blinded by blood, he tripped and fell; the men continued stabbing him as he lay defenseless on the lower steps of the portico. According to Eutropius, around 60 or more men participated in the assassination. He was stabbed 23 times. According to Suetonius, a physician later established that only one wound, the second one to his chest, had been lethal. The dictator's last words are not known with certainty, and are a contested subject among scholars and historians alike. Suetonius reports that others have said Caesar's last words were the Greek phrase (transliterated as "Kai su, teknon? ": "You too, child?" in English). However, Suetonius says Caesar said nothing. Plutarch also reports that Caesar said nothing, pulling his toga over his head when he saw Brutus among the conspirators. The version best known in the English-speaking world is the Latin phrase "Et tu, Brute?" ("And you, Brutus? ", commonly rendered as "You too, Brutus? "); this derives from Shakespeare's Julius Caesar, where it actually forms the first half of a macaronic line: "Et tu, Brute? Then fall, Caesar." It has no basis in historical fact and Shakespeare's use of Latin here is not from any assertion that Caesar would have been using the language, rather than the Greek reported by Suetonius, but because the phrase was already popular when the play was written. Caesar's body was cremated, and on the site of his cremation the Temple of Caesar was erected a few years later (at the east side of the main square of the Roman Forum). Nowadays, only its altar remains. Archaeologists believe they have found the first physical evidence of the spot where Julius Caesar died, according to a new Spanish National Research Council report. Caesar, the head of the Roman Republic, was stabbed to death by a group of rival Roman senators on March 14, 44 B.C, the Ides of March. The assassination is well-covered in classical texts, but until now, researchers had no archaeological evidence of the place where it happened. Now, archaeologists have unearthed a concrete structure nearly 10 feet wide and 6.5 feet tall (3 meters by 2 meters) that may have been erected by Caesar's successor to condemn the assassination. The structure is at the base of the Curia, or Theater, of Pompey, the spot where classical writers reported the stabbing took place. The result unforeseen by the assassins was that Caesar's death precipitated the end of the Roman Republic. The Roman middle and lower classes, with whom Caesar was immensely popular and had been since before Gaul, became enraged that a small group of aristocrats had killed their champion. Antony, who had been drifting apart from Caesar, capitalized on the grief of the Roman mob and threatened to unleash them on the Optimates, perhaps with the intent of taking control of Rome himself. However, to his surprise and chagrin, Caesar had named his grandnephew Gaius Octavian his sole heir, bequeathing him the immensely potent Caesar name and making him one of the wealthiest citizens in the Republic. The crowd at the funeral boiled over, throwing dry branches, furniture and even clothing on to Caesar's funeral pyre, causing the flames to spin out of control, seriously damaging the Forum. The mob then attacked the houses of Brutus and Cassius, where they were repelled only with considerable difficulty, ultimately providing the spark for the Liberators' civil war, fulfilling at least in part Antony's threat against the aristocrats. However, Antony did not foresee the ultimate outcome of the next series of civil wars, particularly with regard to Caesar's adopted heir. 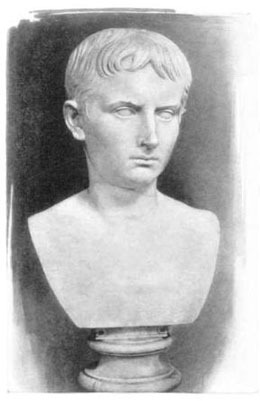 Octavian, aged only 18 when Caesar died, proved to have considerable political skills, and while Antony dealt with Decimus Brutus in the first round of the new civil wars, Octavian consolidated his tenuous position. To combat Brutus and Cassius, who were massing an enormous army in Greece, Antony needed soldiers, the cash from Caesar's war chests, and the legitimacy that Caesar's name would provide for any action he took against them. With the passage of the lex Titia on 27 November 43 BC, the Second Triumvirate was officially formed, composed of Antony, Octavian, and Caesar's loyal cavalry commander Lepidus. 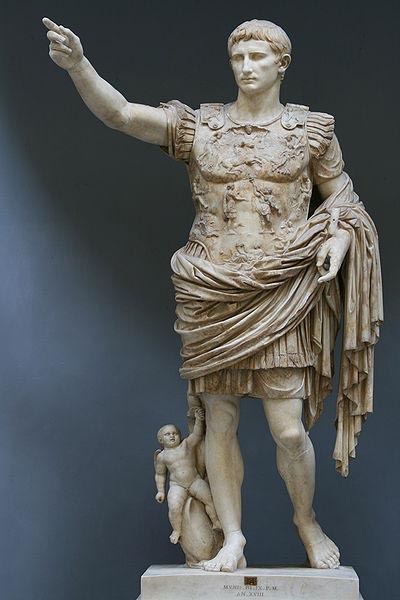 It formally deified Caesar as Divus Iulius in 42 BC, and Caesar Octavian henceforth became Divi filius ("Son of a god"). Because Caesar's clemency had resulted in his murder, the Second Triumvirate reinstated the practice of proscription, abandoned since Sulla. It engaged in the legally-sanctioned murder of a large number of its opponents to secure funding for its forty-five legions in the second civil war against Brutus and Cassius. Antony and Octavius defeated them at Philippi. Julius Caesar was the first historical Roman to be officially deified. He was posthumously granted the title Divus Iulius or Divus Julius (the divine Julius or the deified Julius) by decree of the Roman Senate on 1 January 42 BC. 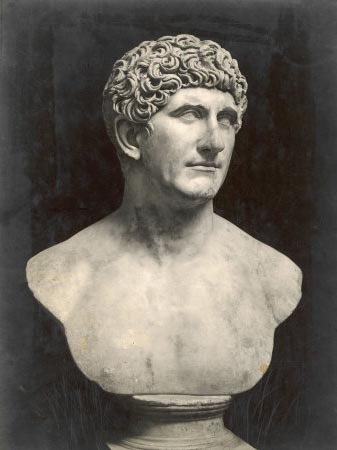 Though his temple was not dedicated until after his death, he may have received divine honors during his lifetime:and shortly before his assassination, Mark Antony had been appointed as his flamen (priest). Both Octavian and Mark Antony promoted the cult of Divus Iulius. After the death of Antony, Octavian, as the adoptive son of Caesar, assumed the title of Divi Filius (son of a god).